There are actually a few reason why cats knead with their paws. From territorial marking to emotional security and love, this deeply-rooted behavior is fascinating. You've probably witnessed the behavior hundreds of times. You might even have been the recipient of it. Kitty picks out a likely spot and begins working those paws like she's stomping grapes with Lucy and Ethel. Sometimes it's just soft pawing; sometimes the claws spring into action. A cat can become completely engrossed during this kneading business. 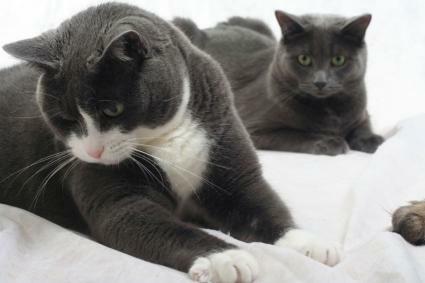 Felines just seem to have a deep-seated need to knead, and they are not particularly concerned whether they are kneading their own comfy cat bed, your couch cushions, or better yet, your lap. The question seems to be not so much whether they enjoy this activity, but what inspires them to do it. According to VetInfo, there are a couple of reasons why cats exhibit this behavior. One reason why cats knead stems from their kittenhood. Kittens must nurse their mother to get life-sustaining milk. Kneading mom's teats stimulates the let-down response and causes the milk to flow more freely. The movements are instinctive, and since they incur a reward, kitty naturally transfers the behavior to other places and things in the hope of more good things to come. There's another popular theory that cats knead because they might have been weaned from their mother too early, and they are acting out the behavior of their "inner kitten." In reality, this probably isn't the answer. After all, have you ever known a cat who didn't knead at one time or another? They can't all have been weaned too early, can they? Kneading seems to be more of a comforting action for cats since it mainly takes place during periods of happiness and contentment. It would be quite unusual to see a cat stop to knead with its paws when it feels angry or threatened. While kitty generally kneads to make sure its chosen spot is as comfy as possible, there is another reason for this behavior. Cats have scent glands located in the pads of their feet near the base of their claws, and each feline produces its own unique scent. While humans don't generally notice this scent, other cats and animals can. So, the scent serves as a marker to show where your cat has been or what she wishes to claim for her own. When kitty wants to mark out the boundaries of her territory, she will paw and perhaps even run its claws across the item, leaving those signature scratches and a bit of personal eau de feline in the bargain. So now you know why cats knead with their paws. The next time kitty begins to work those pads before curling up in your lap, realize how special you must be. Not only has she chosen you as the exact spot on the planet where she'd most like be, she's also letting the rest of the animal world know that you belong to her. Now doesn't that make it easier to grin and bear it?